Shopping for a new Mazda CX-5? Start CX-5 shopping at the Touring level, where standard equipment includes full-speed automatic emergency braking and Apple CarPlay/Android Auto compatibility. The 2019 Mazda CX-5 sates solo drivers with good handling and tasteful lines, but bigger families will want to move up in size. The 2019 Mazda CX-5 pits practical against pretty. 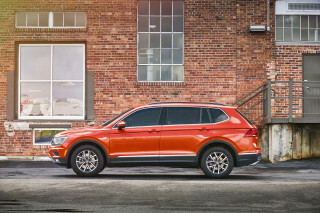 Other crossover SUVs deliver bigger back seats and more cargo hold. But they don’t look as good, and none handle as well. Mazda sells the 2019 CX-5 in Sport, Touring, Grand Touring, Grand Touring Reserve, and Signature trims. The former three sport a 187-horsepower inline-4 and a 6-speed automatic that generates moderate speed and a fair amount of thrash. All-wheel drive’s an option. Big spenders will move up to the top trims, which get a 227-hp 2.5-liter turbo-4 that’s quicker, but lags a bit and weighs more, too. While its drivetrains lack a certain sparkle, the CX-5’s handling gleams. It rides with firm assurance, and gently covers bumps without bruising, even with 19-inch wheels and stiffer suspension tune. The CX-5 surrounds front-seat passengers with smartly decorated space and well-bolstered seats. The second row, not so much: It feels shy on head and shoulder room, and the bench doesn’t slide to boost leg room. It does fold to double cargo storage. All CX-5s wear pleasantly coordinated trim, but Signature models with wood on the dash and nappa leather on the chairs are low-key dazzlers. The 2019 CX-5 excels at crash tests, but the base Sport only gets low-speed automatic emergency braking. Touring editions sport the gear we consider essential, and that includes Android Auto/Apple CarPlay compatibility. From the Touring level on up, the CX-5 makes for a less convincing value, especially given the disparity between the refinement its shape promises, and the refinement its powertrain lacks. But no one ever said looking this good would be easy. Mazda’s sculpting skills pay off in the 2019 CX-5’s sophisticated shape. 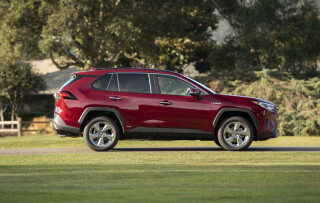 When you talk about styling, only a few crossover SUVs elbow their way into the conversation. The Mazda CX-5 is one. Its pretty sheet metal wrap around a warm, inviting cabin that only gets better in higher trims. Spin around the side and it gets even better. The windshield lays back and signals sporty virtues, while the door cuts tuck quietly into a low roofline and a pert rear end. Compare the CX-5’s taillight-to-tailgate ratio against, say, a 2019 Blazer, and you’ll appreciate better Mazda’s artful balance of style against purpose. The cabin wears well in Mazda’s base CX-5, with cloth seats and plainer dash trim. It can be busy, but especially in pricey versions, it’s muted by strips of wood, matte leather, well-grained plastics. The high center console and tall gauges communicate a different priority than other crossovers that go all-in on asymmetry or horizontal themes. What we don’t like: The budget-motel LCD screen on the dash. At 7.0 inches, it’s not big enough to make a statement, never mind big enough to work well. Mazda balances ride comfort and handling well in the CX-5, but the new turbo drivetrain lags rivals. The 2019 CX-5 fits a new turbo-4 under its hood on its top two trims, while it leaves the crossover’s otherwise reasonable-to-good performance alone. We praise its ride and steering, but both its powertrains are slightly off the mark. The 2019 CX-5 comes with either an inline-4 or a turbo-4. 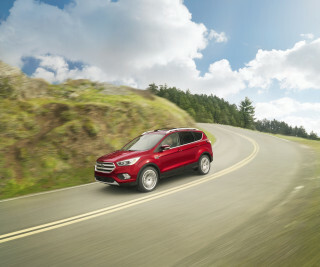 Front-wheel drive is standard with the inline-4, and all-wheel drive is an option; turbo-4 versions come only with AWD. In its base trim, the CX-5 runs a spirited race for mediocrity. Its 2.5-liter inline-4 puts out 187 horsepower and 186 pound-feet of torque, and shuttles it to the ground through a 6-speed automatic. The combination, new just a year ago, has good throttle response and decent fuel economy, but it’s not terribly ruthless off the line. Lighter front-drive models manage 8.6-second runs to 60 mph, according to Mazda; with AWD, it’s 8.8 seconds, measured on standard unleaded fuel. It’s par for the base-crossover course, but engine thrash and noise is present whenever the engine spins higher than 3,000 rpm or so. The 2.5-liter turbo-4 from the CX-9 and Mazda 6 join the CX-5 this year. Rated at 227 hp at 5,000 rpm and 310 lb-ft of torque at 2,000 rpm, the turbo-4 peaks higher and has fewer gears than some crossovers with which to deal with its uprated power. It lags from a stop, takes a second to compose itself before it vaults forward. Mazda says it’s good for 7.3 seconds to 60 mph—but it also confirms that figure came from 93-octane fuel. That difference might explain why the turbo CX-5 feels a little less distinctive from the base engine—that, and the fact it carries curb weight up from 3,541 pounds to 3,825 pounds. A Sport switch on the transmission lets the 6-speed hold gears longer, but the staging of the ratios doesn’t do the CX-5 many favors, either. More drivers choose out of CR-Vs and RAV4s, and opt into CX-5s, for the Mazda’s smartly tuned handling. It’s still on display in the 2019 CX-5. With an independent suspension at all four corners—struts in front, links in back—the CX-5 pulls a firm leash on boundy ride motions. We’ve driven Sport models with a slightly softer ride thanks to 17-inch wheels and tires, and loaded Signature turbos with big 19-inch wheels that fell just on the right side of firm. The CX-5’s electric power steering does a better job of listening than most crossover-SUV racks. The effort in corners builds up weight in a natural way, and the car holds a cornering line with clarity. It reduces fatigues and involves the driver more; it’s technology and tuning worth sharing. The latest CX-5 handles front passengers and cargo with ease; the second row’s snug. The 2019 Mazda CX-5 comforts front passengers and coddles cargo, but thinks small for back-seat passengers. With an overall length of 179.1 inches and a wheelbase of 106.2 inches, the Mazda CX-5 isn’t among the larger five-passenger crossovers. It’s relatively petite, but in front, driver and passenger won’t notice any size deficit. They’re treated to space that mimics that in Mazda’s mid-size 6 sedan, with fine head and leg room. In top trims the CX-5’s sporty leather-covered seats have firm bolsters to cinch in front passengers, as well as heating and cooling; it’s been a minute since we saw one with cloth, though. The CX-5’s center console gets ate up with futzy infotainment stuff (more on that in a bit), but there’s good storage for a smartphone. The USB port in the glovebox is a modern inconvenience, but you shouldn’t be on the screen while driving anyway. In back, the CX-5 feels smaller than its measurements. With 41.0 inches of front and 39.6 inches of rear leg room, it confuses passengers who slip in the generally flat rear bench and expect more spread-out space. Three adults across is nearly a non-starter, though three kids will be fine, if they’re still of medium stature. The CX-5 fares better in cargo space. It’s not anywhere near as large as a Blazer, but it’s better than a Rogue Sport, with about 31 cubic feet of space behind the back seat, and just about 60 cubic feet with the rear seats folded flat. 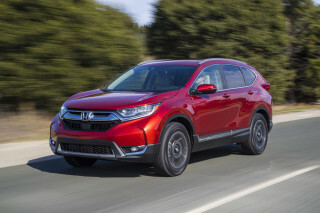 It’s shy by about 10 to 15 percent versus the brutally good Honda CR-V and Toyota RAV4. That said, the CX-5’s cabin can be a much more charming place to spend a lot of time. Top Signature versions get layered wood trim and supple Nappa leather, but even the less expensive versions show Mazda’s fine attention to detail. The same hands that composed the interior should pay some attention to the graunchy engine noise. The 2019 CX-5 gets excellent crash-test ratings. The 2018 Mazda CX-5 rates well for its safety features, and in crash tests. But full-speed automatic emergency braking isn’t standard. Every CX-5 comes with automatic emergency braking; Mazda’s standard version works at city speeds well, as we found during our test drive. 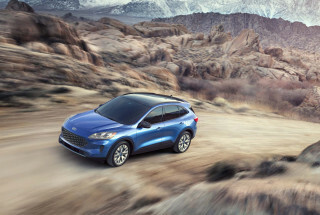 Full-speed automatic emergency braking costs extra on the base Sport, but comes standard on all other models, along with blind-spot monitors, adaptive cruise control, and active lane control. You’ll have to buy a Signature to get a surround-view camera system, though. Crash-test data gives the 2019 CX-5 a Top Safety Pick+ award from the IIHS, and five stars overall from the NHTSA. The IIHS score has risen thanks to updated the LED headlights with automatic high-beams on high-spec versions. The standard LED headlights don’t rate as highly. The CX-5 has a lovely shape, but the rear pillars cut into what otherwise would be good outward vision. Mazda picks up points for value with the 2019 CX-5, but loses them for icky infotainment. 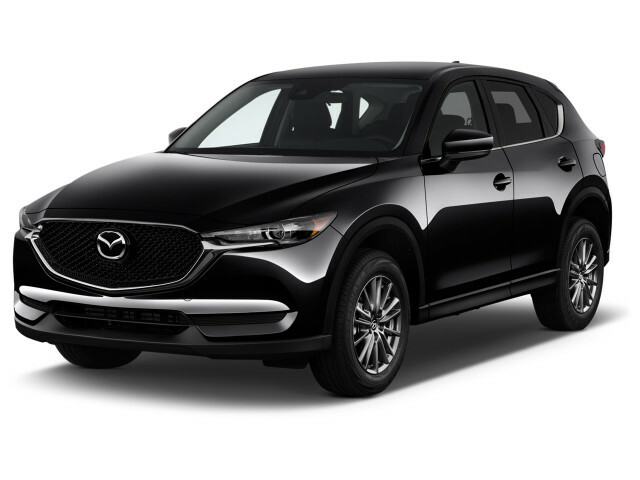 The 2019 Mazda CX-5 boasts a fair amount of standard equipment, and bundles what we’d think of as options in distinct trim levels. The effect’s the same: It’s a well-equipped crossover SUV with great value in lesser trims, but one that’s saddled with a terrible infotainment system. The 2019 CX-5 comes in five trim levels. Sport, Touring, and Grand Touring come with the base 4-cylinder and front-wheel drive; all-wheel drive’s a $1,400 upcharge. Grand Touring Reserve and Signature editions come with AWD and the turbo-4. The $25,345 CX-5 Sport gets power features, cloth upholstery, 17-inch alloy wheels, LED headlights, blind-spot monitors, low-speed automatic emergency braking, and a 7.0-inch touchscreen for infotainment. Mazda’s touchscreen lags behind rivals in many ways, but responsiveness is maybe its biggest weakness. Redundant rotary controls on the console seem to react more quickly, but the hash of interfaces needs a rethink. Mazda will let Sport drivers upgrade to a package with full-speed automatic emergency braking, active lane control, and adaptive cruise control. Navigation and remote start come as options, too. The $27,605 CX-5 Touring adds Apple CarPlay and Android Auto, along with synthetic leather upholstery, keyless ignition, a power driver’s seat, heated front seats, and dual-zone automatic climate control. It’s our pick for value in the CX-5 lineup. A $1,375 Touring Preferred package kicks in Bose audio, a power tailgate, and a moonroof. The $31,040 CX-5 Grand Touring has leather upholstery, a power passenger seat, 19-inch wheels, three years of satellite radio, and navigation, while the $1,625 Grand Touring Premium Package gains a head-up display, cooled front seats, a heated steering wheel, and heated rear seats. At the top of the range the $35,865 Grand Touring Reserve has the turbocharged engine as well as the Premium package, while the $37,885 CX-5 Signature wears 19-inch wheels, a black headliner, Nappa leather seats, and wood trim, and adds a surround-view camera system and front and rear parking sensors. Turbocharged power cuts into the 2019 Mazda CX-5’s gas mileage, as you’d expect. The base front-drive CX-5 is EPA-rated at 25 mpg city, 31 highway, 28 combined. With all-wheel drive, the CX-5 without turbocharging checks in at 24/30/26 mpg. 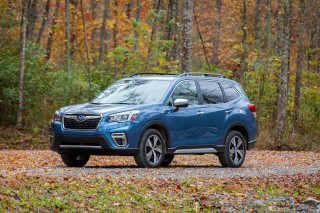 Worth noting: Subaru’s Forester outpaces those figures at 29 mpg combined. 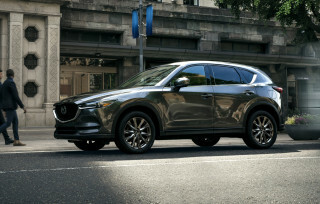 The turbo-4 CX-5 gets an EPA rating of 22/27/24 mpg; the EPA publishes a rating of 23/28/25 mpg for a front-drive turbo that Mazda has not yet confirmed will join the lineup. Non-turbo CX-5s can shut off half their cylinders when they need less power, in the name of saving fuel. Turbos can’t do that.